Successfully Added Bluetooth Speaker & LED Lamp - 6LED Light Modes, Touch Button, Sleep Mode, SD Card Slot, 22H Play Time, Bluetooth 4.0 to your Shopping Cart. Rock to fantastic music with this quality Bluetooth speaker and lamp featuring touch sensitive light, SD card support, alarm clock, sleep mode and super long battery life. 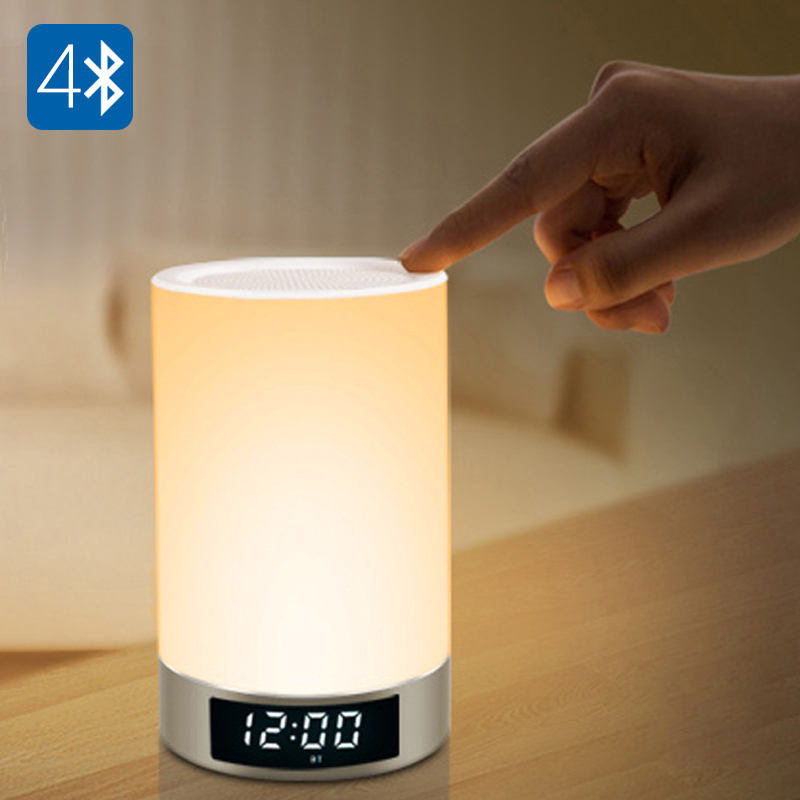 The perfect speaker for your living room, office or bedroom this Bluetooth 4.0 speaker has a RGB ambient light that can be adjusted to suite your mood using the touch sensitive button. connect to your Smartphone, tablet PC or laptop from up to 10 meters away and have faultless audio playback thanks to the low energy highly accurate Bluetooth 4.0. Alternatively slip in an Micro SD card and enjoy up to 64GB of music directly from the speaker itself. With its 4000mAh battery you can enjoy up to 22 hours of continues music, the sleep function lets you set the speaker to turn off after 10 minute intervals up to 120 minutes so you wont needlessly run down the batteries. This makes it a great night light for the youngsters and it can play soft music to help them nod off to sleep. Although they probably won't need to make use of the alarm mode for waking up early. Making a great addition to any room whether for tranquil relaxation of creating a party atmosphere this quality Bluetooth speaker comes with a 12 months warranty, brought to you by the leader in electronic devices as well as wholesale Bluetooth lamps and speakers..